Just in time for Christmas, SM Center Ormoc open its doors to bring great shopping, leisure and entertainment to Leyteños on Friday, November 16. It is SM Prime holding’s 72nd mall and the 7th in the Visayas region. Mayor Richard Gomez, LeyteRep. Lucy Marie Torres-Gomez, Herbert Sy, Naval Archbishop Filomeno Bactol, Hanns Sy led in the ceremonial cutting of the ribbon to officially open the mall. SM Center Ormoc is located along Real St. Ormoc City. 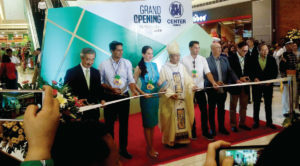 ORMOC CITY- Residents from this city, in particular, could now enjoy a more relaxing and comfortable movie watching with the opening of SM Center Ormoc which offers three digital cinemas and one Director’s Club Cinema on Friday (Nov.16), which could accommodate about 390 moviegoers in all. The cinemas are all equipped with state-of-the-art technology that will give moviegoers an exciting movie viewing experience. Cinema 1 and 2 has 118 seats each while Cinema 3 has 114 seats. And for the first time ever, Ormocanons could now experience movie watching while sitting on Laz- boy chairs and on-call butler service by watching their favorite movie at Director’s Club cinema, and with only 40 seats, would give them some measure of privacy. SM Center Ormoc’s three digital cinemas and Director’s Club Cinema showcases a new concept with urban materials such as brick and metal highlighted against bright and contemporary colors. Thus, with this kind of design, all the cinemas are not only “instagram-able’ but cozy and fictional. Ticket and snack time booths are framed by edgy weathered steel borders, and lighting features are designed as visual features. Moviegoers could enjoy a 50 percent discount of the ticket price during the weekend opening, or from Nov.16 to Nov.18.